Going to need more than 60 Seconds to geek out about the 2016 Conundrum Rosé. Conundrum is made by the Wagner family who founded Caymus Vineyards in Napa Valley in 1971. Along with Caymus and Conundrum, the Wagners have developed a portfolio of wine brands made by Chuck Wagner and his kids, Charlie and Jenny, including Mer Soleil, Old Cannery Row, Red Schooner, 1858 Wines and Emmolo. Chuck’s other son, Joe Wagner, also makes several wines with Copper Cane Wine & Provisions including Belle Glos, Elouan, Tuli, Beran, Torial, Carne Humana, The Willametter, Napa Quilt and BÖEN. With the Caymus Special Selection, the Wagners hold the distinction of being the only winery to produce a wine that has twice been named the number one wine on Wine Spectator’s yearly Top 100 list for the 1984 and 1990 vintages. The Conundrum series of wines were introduced in 1989. That first wine was a white blend of Chardonnay, Sauvignon blanc, Sémillon, Viognier and Muscat Canelli/Moscato. Over the years the brand has expanded to include a red blend (primarily Zinfandel, Petite Sirah and Cabernet Sauvignon), a sparkling wine (Pinot gris, Viognier, Muscat Canelli and Chenin blanc) and, since 2016, a rosé. 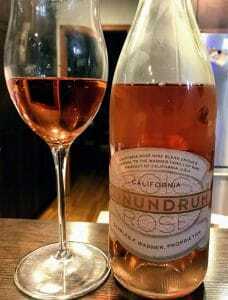 The fruit for Conundrum are sourced throughout California. Vineyard sources over the years have included the North Coast wine regions of Napa and Solano County, the central coast areas of Monterey, San Benito and Santa Barbara County as well as the inland vineyards of Tulare County south of Fresno. 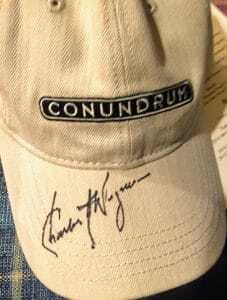 My Conundrum hat autographed by Chuck Wagner. The wines are made in Monterey County by Chuck’s son Charlie with Jon Bolta assisting and overseeing the white wine production. The 2016 Conundrum rosé is made from the Valdiguié grape sourced from Paso Robles. It is not widely published how many cases of the rosé are produced but previous vintages of the Conundrum Red have topped 120,000 cases and nearly 90,000 cases for the white. The Valdiguié grape originated in Southwest France, likely in either the Tarn-et-Garonne or Lot-et-Garonne departments. Jancis Robinson, Julia Harding and José Vouillamoz note in Wine Grapes that the first documented mention of the grape, under the name of Valdiguier, appeared only in 1884 which leads to a few theories about Valdiguié’s origins. One theory involves a landowner from the late 18th century in the village of Puylaroque in the Tarn-et-Garonne named Valdéguier who propagated different grape varieties in his courtyard garden. Another theory centers around a grower named Jean-Baptiste Valdiguié. In 1845, he had a vineyard in the hamlet of Tressens near Puylaroque where he may have propagated the grape. Around this same time, in the neighboring department of Lot-et-Garonne, there was a vineyard worker named Guillaume Valdiguier who may have propagated Valdiguié from an abandon vineyard once owned by the Templiers monastery in Aujols. The Garonne river (highlighted in box) flows through Southwest France and eventually meets up with the Gironde estuary in Bordeaux. It is likely that the Valdiguié grape originated somewhere in this area. A parent-offspring relationship between Valdiguié and the nearly extinct Fronton grape Mérille of the Lot-et-Garonne has been suggested by ampelographers but so far has not been confirmed by DNA analysis. Prevalent in Southwest France in the 19th century until phylloxera, Mérille was once one of the minor blending grapes of Bordeaux. In the early 20th century, Valdiguié’s tolerance to powdery mildew and reliable yields saw its plantings greatly expand. It reached a peak of 4,908 ha (12,128 acres) in 1958. But the grape eventually lost ground to other more popular plantings. By 2008, there were only 145 ha (358 acres) planted in Southwest France, Provence and the Languedoc. In California, growers misidentified Valdiguié as the Gamay grape of Beaujolais (Gamay noir). It’s productivity help the grape became a popular planting in the decades following Prohibition. Over 6000 acres of “Napa Gamay” was planted by 1977. The grape was often fermented using the carbonic maceration method commonly used for Beaujolais Nouveau to produce fruity, easy drinking wines with moderate alcohol. While Valdiguié is grown in several places in California, the fruit for the 2016 vintage of the Conundrum rosé was sourced from Paso Robles. Pictured is a Cabernet Sauvignon vineyard from the region. In 1980, the French ampelographer Pierre Galet noted that Napa Gamay was actually Valdiguié. Napa Gamay is still officially recognized as a synonym for the variety. However, most producers today label their wines as Valdiguié. As in France, acreage of Valdiguié began steadily dropping as other varieties earned greater focus and market share. As of 2017 there was 251 acres of the grape. Significant plantings can be found in Napa Valley, Suisan Valley, Solano County, Lodi, Redwood Valley, Paso Robles, Mendocino County, Monterey and the Madera AVA. In the Calistoga AVA of Napa, the Frediani vineyard has old vine Valdiguié that were planted as early as 1935. Beyond Conundrum, other notable producers of Valdiguié include Forlorn Hope and Driscoll Wine Co.’s vineyard designated wines from Frediani Vineyard, J. Lohr and the pétillant naturel (Pet-Nat) Valdiguié made by Cruse Wine Co. and Broc Cellars. Medium-plus intensity nose. A mix of cantaloupe fruit and subtle rind-like earthiness. There is also red fruit that isn’t as defined or dominant as that melon and rind note. On the palate, the cantaloupe comes through with medium-plus acidity adding freshness. It is actually quite vibrant for a 2 year old rosé. The rind notes also carry through with a pithy, phenolic texture. Those phenols adds medium-minus bodied weight to this dry rosé but doesn’t stray to bitterness. The red fruit becomes a little more pronounced as strawberries but fades quickly with the finish. At $18-22, you are paying a tad bit of a premium for the geeky variety. But it is not that out of line for the uniqueness and quality of the wine. I was expecting this wine to follow suit with the Conundrum White and Red and have noticeable residual sugar. Instead this rosé was distinctly dry and well made. While many mass-produced rosés decline in quality after a year in bottle, the Conundrum rosé still has freshness and vibrancy. However, the short finish and nondescript red fruit does give away its age. If you have a bottle, I would recommend drinking it soon or look for a newer vintage. Tagged 1858 Wines, Beaujolais, Belle Glos, Beran, BÖEN, Broc Cellars, Cabernet Sauvignon, carbonic maceration, Carne Humana, Caymus, Charlie Wagner, Chenin blanc, Chuck Wagner, Conundrum, Copper Cane Wine & Provisions, Cruse Wine Co., Driscoll Wine Co., Elouan, Emmolo, Forlorn Hope, Frediani Vineyard, Gamay, Jancis Robinson, Jenny Wagner, Joe Wagner, Jon Bolta, José Vouillamoz, Julia Harding, Lodi, Madera AVA, Mendocino County, Mer Soleil, Mérille, Monterey, Moscato, Muscat Canelli, Napa Gamay, Napa Quilt, Napa Valley, Old Cannery Row, Paso Robles, Pet-Nat, Petite Sirah, phylloxera, Pierre Galet, Pinot gris, powdery mildew, Prohibition, Red Schooner, Redwood Valley, Rosé Wine, Sauvignon blanc, Semillon, Solano County, Suisan Valley, The Willametter, Torial, Tuli, Valdiguié, Viognier, Wagner family, Wine Grapes, Wine Spectator Top 100, Zinfandel.